The 6th Light Horse Regiment was formed as part of the 2nd Light Horse Brigade, 2nd Contingent and attached to the Australian Division. Recruits went to the Liverpool Training Camp to the west of Sydney, New South Wales, during September 1914. The recruits were drawn from throughout New South Wales. The 6th Light Horse Regiment was formed as part of the 2nd Light Horse Brigade, 2nd Contingent and attached to the Australian Division. Recruits went to the Liverpool Training Camp to the west of Sydney, New South Wales, during September 1914. The recruits were drawn from throughout New South Wales. Many of the men went from the Light Horse Militia formation into the AIF Light Horse. 7th Light Horse Regiment (5 men). 11th Light Horse Regiment (6 men). 27th Light Horse Regiment (5 men). 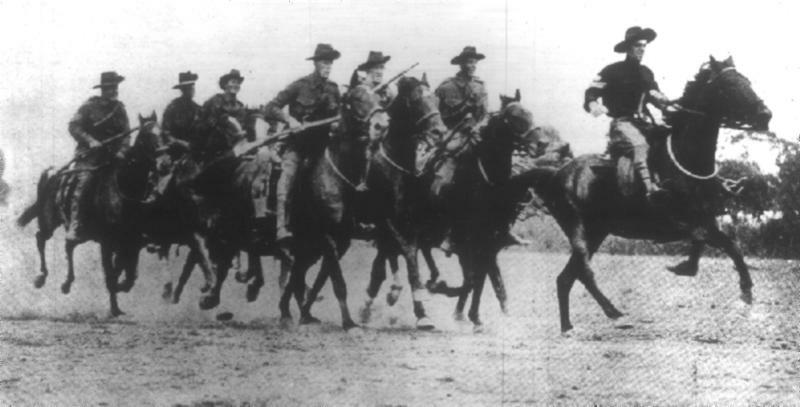 Training of the 6th Light Horse Regiment occurred at Liverpool Training Camp from September 1914. Embarkation of the 6th Light Horse Regiment occurred by the HMAT A34 Suevic from Sydney, New South Wales, on 21 December 1914. The 6th Light Horse Regiment sailed to Egypt and disembarked on 1 February 1915. The earlier systems proved to be ineffective so to assist with identification of the men in the various units within the AIF, Divisional Order No 81 (A) Administration was issued at Mena on 8 March 1915 detailing the Colour Patch for the 6th Light Horse Regiment as others received their colours. The colour patch was made of cloth 1¼ inches wide and 2¾ inches long and worn on the sleeve one inch below the shoulder seam. The colour patch for the 6th Light Horse Regiment was green over red. The 6th Light Horse Regiment carried the red Brigade colour as the lower triangle part of the colour patch, while the green unit colour was on the top. This is illustrated with the above presentation. The 6th Light Horse Regiment distinguished itself from all other Light Horse Regiments with the use of the wallaby fur puggaree on the felt hat. The puggaree is the band around the felt hat, usually made of pleated cloth. As mounted troops, the Light Horse was considered to be unsuitable for work in Gallipoli. The mounted troops volunteered to operate as infantry and thus were sent to Gallipoli with the 6th Light Horse Regiment landing on 20 May 1915. The Regiment was only deployed on defensive activities on the far right of the front line [the southern regions of Anzac] throughout the stay at Gallipoli. The 6th Light Horse Regiment left the peninsula on 20 December 1915. 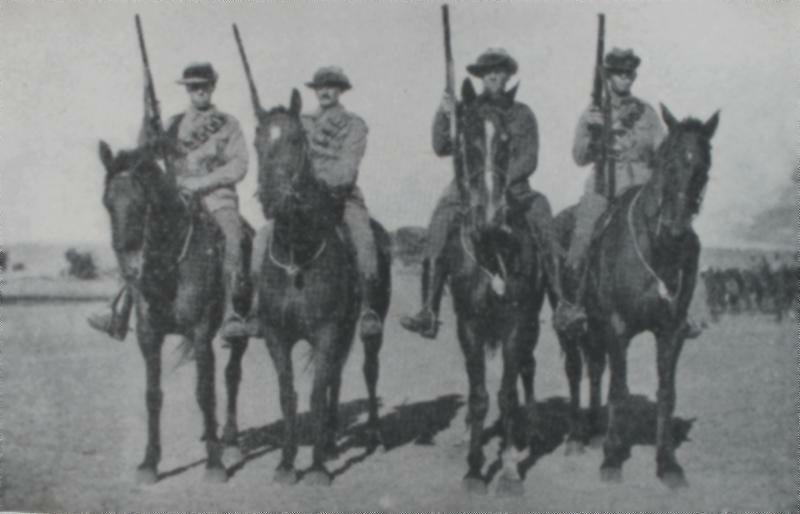 After the return to Egypt, the 6th Light Horse Regiment reformed and re-equipped. The reorganisation of the Light Horse led to the formation of the ANZAC Mounted Division to which the 6th Light Horse Regiment became a foundation member. On 28 February 1916, the 6th Light Horse Regiment moved to join its parent brigade, the 2nd Light Horse Brigade, which was taking part in the defence of the Suez Canal. The work was hot and monotonous. They remained here until moved to the Romani region to bolster the defence of that area. The 2nd Light Horse Brigade played an important role in beating back the Turkish invasion of the Suez Canal zone at Romani. Now known as the Battle of Romani which lasted from 4-6 August which was quickly followed by the Battle of Katia and then Bir el Abd on 9 August. All the actions in which the 6th Light Horse Regiment finally led to the defeat of the Ottoman Canal Expeditionary force and its retreat to Bir el Mazar. Over the next few months, the 6th Light Horse Regiment took part in the Allied advance over the Sinai leading to the fall of Bir el Mazar, then El Arish followed by Bir el Magdhaba and finally Rafa in January 1917. The Ottoman forces were expelled from the Sinai and were poised to be tackled in Palestine. On 27 March 1917, the 6th Light Horse Regiment took an adventurous role during the First Battle of Gaza. While involved in the encirclement of the city as a prelude to its capture, the 6th Light Horse Regiment received the order to withdraw and return to the starting line. Grudgingly they did so but realised the Turks had snatched victory out of the jaws of defeat. The 6th Light Horse Regiment took part in the Second Battle of Gaza on 19 April 1917 and suffered the heaviest casualties since Gallipoli. The 6th Light Horse Regiment took part in the Battle of Beersheba and then the follow up actions that lasted until early January 1918. After the fall of Jerusalem the 6th Light Horse Regiment moved to the Jordan Valley and took parts in operations in this region. This included the taking of Jericho, the attack on Amman during 27 March - 2 April 1918 and Es Salt Raid of 30 April – 4 May 1918. At the opening of the final Allied offensive on 19 September 1918, the 6th Light Horse Regiment took part in the invasion of the Moab hills for the third time. This time Amman was captured with the participation of the 6th Light Horse Regiment. Finally, the Ottomans called for an Armistice on 30 October 1918. After the conclusion of hostilities, the 6th Light Horse Regiment was marked to return to Australia. 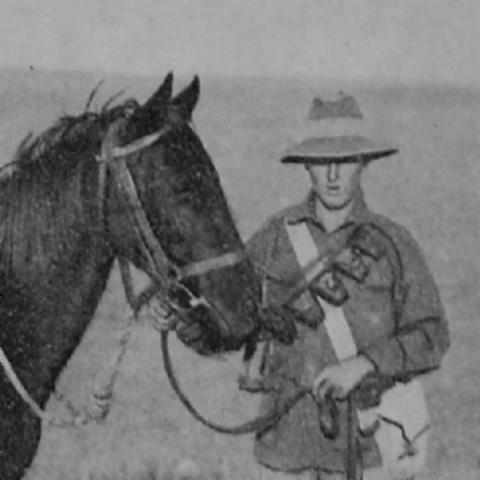 Prior to that action, one of the saddest actions occurred for the Australian Lighthorsemen, they had to farewell their best friends, the horses. All the Light Horse unit horses' health was ascertained with the fit horses being transferred to the Indian Cavalry while those in poor condition were destroyed by the Veterinary units. On 13 March 1919 the 6th Light Horse Regiment was deployed to assist in suppressing the Egyptian Uprising. 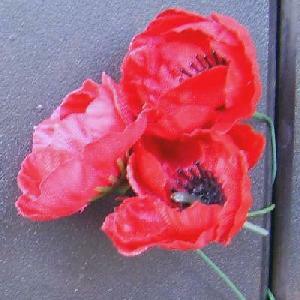 When the revolt collapsed, the 6th Light Horse Regiment embarked on the 28 June 1919 for the long voyage to Australia where the unit was disbanded. 6th Light Horse Regiment War Diaries. 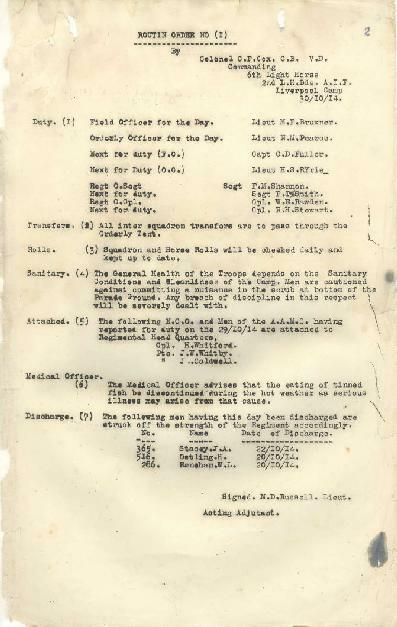 The following list details all the embarkations in support of the 6th Light Horse Regiment, AIF, during the Great War. Each entry details the individual soldier's: rank on embarkation; full name; Declared age; last occupation held; last address as a civilian; enlistment Date; and, ultimate fate. Each man is linked to a brief military biography where ever possible. One interesting point is that many of the men listed in the embarkation roll for the 5th Light Horse Regiment ended up in a different unit altogether. This list details the men's starting point in the AIF. The Roll of Honour contains the names of all the men known to have served at one time with the 6th Light Horse Regiment and gave their lives in service of Australia, whether as part of the 6th Light Horse Regiment or another unit. James Daniel ADAMS, Killed in Action, 16 July 1916. Francis AHERN, Killed in Action, 16 April 1918. Herbert Haddon ANDERSON, Died of Disease, 4 February 1917. John ANDERSON, Died of Wounds, 3 March 1917. Victor Wadsworth ASHWORTH, Killed in Action, 7 November 1917. Cyril Hastings BACON, Died of Disease, 24 October 1915. Ernest John BAKER, Died of Wounds, 29 March 1918. David William BALDIE, Died of Wounds, 9 June 1915, and subsequently buried at sea. Harry Franklin BALDWIN, Died of Wounds, 2 February 1917. Percival Gilbert BARROW, Killed in Action, 8 November 1917. Brian Templer BARTON, Killed in Action, 3 December 1917. Nelson Thomas BAXTER, Killed in Action, 8 August 1918. Harold Augustine BECK, Killed in Action, 4 December 1916. Burt BELLINGER, Died of Wounds, 18 June 1915. James Norman BENNETT, Killed in Action, 4 October 1917. Reginald BLACK, Died of Wounds, 17 August 1917. Lewis Gordon BLACKMORE, Killed in Action, 23 July 1916. Raymond John BLOODWORTH, Killed in Action, 29 November 1917. William McGregor BONNAR, Died of Wounds, 13 June 1915, and subsequently buried at sea. Henry William BOWD, Died of Accident, 25 October 1917. Edward BOYLE, Killed in Action, 28 March 1918. Alexander BRADSHAW, Killed in Action, 28 March 1918. William Keating BRENNAN, Died of Wounds, 20 April 1917. Herbert William BROUGH, Died of Wounds, 1 May 1917. Henry Sangster BROWN, Killed in Action, 28 May 1915. Arthur BULT, Died of Disease, 15 February 1918. William Henry BURLACE, Killed in Action, 28 March 1918. Frank Alexander BUSKIN, Killed in Action, 17 September 1915. William Henry CALLAN, Killed in Action, 1 May 1918. Norman Harold CAMPBELL, Killed in Action, 30 March 1918. Stanley John CAMPBELL, Killed in Action, 30 March 1918. John Oswald CARTER, Died of Wounds, 4 October 1915, and subsequently buried at sea. Lyle Joscelin CHASE, Died of Disease, 11 November 1918 . Henry Joseph CHRISTIE, Killed in Action, 29 November 1917. Frederick James COLLINS, Killed in Action, 27 March 1918. Percival Robert John COLLINS, Killed in Action, 30 March 1918. Noel McLeod CONRAN, Killed in Action, 28 July 1916. Wilmot COOKE, Killed in Action, 8 October 1918?. Frederick James COTTERELL, Killed in Action, 2 September 1918. Bertram Lindsay CRAWFORD, Died of Disease, 13 February 1917. Errol Joseph Hart CREER, Died of Wounds, 12 July 1915, and subsequently buried at sea. Richard Walter CROZIER, Killed in Action, 4 August 1916. Roy Fergus CUNNINGHAM, Killed in Action, 26 October 1917. Douglas Pulteney DALZELL, Killed in Action, 7 August 1915. Dennitt DAVIS, Killed in Action, 4 August 1916. Arnold Lorimer DENNY, Died of Wounds, 26 July 1916. Eric Fanc DeSALIS, Killed in Action, 5 November 1917. Norman DIGBY, Died of Wounds, 6 August 1916. Halven Roy DRADY, Killed in Action, 5 August 1916. William Colburt DUDDLE, Died of Wounds, 28 December 1917. John Irving DUDLEY, Died of Wounds, 9 November 1917. John Alexander DUNLOP, Died of Wounds, 28 November 1917. George DUNN, Died of Disease, 3 June 1915. Arthur EARLE, Died of Disease, 2 September 1915. Frederick George EATON, Killed in Action, 19 April 1917. Edward Gomer EDDY, Died of Accident, 12 November 1917. Frederick George ELLIS, Killed in Action, 12 July 1915. Arthur EMERY, Killed in Action, 19 April 1917. James Greer Gould FAIRBAIRN, Killed in Action, 4 December 1917. Thomas Edward FARLEY, Killed in Action, 4 October 1917. Arthur Wallace Kemmis FARQUHAR, Killed in Action, 26 June 1918. Alan Francis FARRAR, Died of Wounds, 23 July 1915. William Martin FENDER, Died of Wounds, 19 April 1917. Joshua Paul FIELD, Died of Disease, 17 November 1916. Charles Patrick FITZPATRICK, Died of Disease, 17 June 1916. Gordon FLANAGAN, Killed in Action, 3 August 1915. Robert James FOSTER, Died of Wounds, 6 November 1917 . Stanley Edgar David FOX, Died of Disease, 25 September 1918. Sydney Charles FRY, Died of Accident, 24 August 1918. Frederick Russell GALBRAITH, Killed in Action, 28 March 1918. Lawrence Martin GALLAGHER, Killed in Action, 28 March 1918. George Lewis GATONBY, Died of Wounds, 8 August 1915. George Campbell GEAR, Died of Wounds, 29 March 1918. Arthur GEE, Died of Wounds, 13 September 1915. Matthew Rae GIBSON, Died of Wounds, 19 July 1915. Leslie Francis GILES, Died of Disease, 5 June 1915. George Richard GILL, Died of Disease, 19 September 1918. Jack GORRICK, Died of Wounds, 9 August 1918. Reginald GRAHAM, Killed in Action, 5 August 1917. Sidney Ernest GUNTER, Died of Disease, 15 October 1918. Clifford Robert Lang HALLORAN, Died of Wounds, 7 September 1915. James Jarrett HAMILTON, Killed in Action, 13 November 1917. William John HARRIS, Died of Wounds, 14 August 1915. Richard John HAWKEY, Killed in Action, 27 March 1918. Thomas Arthur HAYNE, Killed in Action, 11 April 1917. John HAYNES, Died of Wounds, 22 May 1918. Henry HEATH, Killed in Action, 14 July 1918. Townsend McGregor HILL, Killed in Action, 15 July 1918. Albert Frederick Osborne HOOD, Died of Wounds, 11 June 1917. Richmond Gordon HOWELL-PRICE, Died of Wounds, 4 May 1917. William Bradley INGRAM, Killed in Action, 17 September 1915. Norman Stanley JEFFREY, Killed in Action, 26 May 1915. Neville Murray JOHNSON, Died of Disease, 16 October 1918. Leo Keith JOHNSTON, Killed in Action, 28 March 1918. Major JOHNSTON, Died of Wounds, 18 August 1916. Charles James JONES, Killed in Action, 11 June 1917. John KELLIHER, Killed in Action, 4 August 1916. John Andrew Bathurst KERR, Killed in Action, 19 April 1917. William John Cyril KIDMAN, Killed in Action, 12 July 1915. Edward KING, Died of Wounds, 15 October 1917. Thomas Throsby Smyth KING, Killed in Action, 16 September 1918. Frederick John KLEIN, Died of Wounds, 21 December 1916. Norman KNEIPP, Died of Wounds, 19 December 1917. George LAMBOURNE, Died of Wounds, 25 July 1915, and subsequently buried at sea. William LANG, Died of Wounds, 13 August 1915, and subsequently buried at sea. Jack Warren LAWRENCE, Died of Accident, 14 November 1915. Wallace Douglas LEE, Died of Wounds, 29 October 1917. Lionel William LOVEBAND, Killed in Action, 27 March 1918. Henry Harold MacCARTHY, Killed in Action, 23 July 1916. David Rankin MacKAY, Killed in Action, 2 September 1915 . Lindsay John Robert MacPHERSON, Died of Wounds, 16 April 1917. Walter Cleveland MAKEIG, Killed in Action, 27 March 1918. Frederick MANION, Died of Wounds, 26 November 1915. Thomas Taylor MARSDEN, Killed in Action, 4 October 1917. Henry William MARSHALL, Died of Accident, 9 April 1917. John Andrew MASLEN, Died of Disease, 8 October 1917. Norman Edgar MATHEWS, Died of Accident, 4 February 1917. Frank Walter MATTHEWS, Killed in Action, 17 September 1915. Francis MATZONAS, Killed in Action, 6 November 1917. Reginald Clarence MAYBURY, Killed in Action, 28 March 1918. Rupert Clyde McCARTHY, Died of Disease, 23 February 1919. John William McDONALD, Died of Wounds, 16 November 1915. Alexander McLEOD, Died of Disease, 14 July 1915. John Laidley MERIVALE, Killed in Action, 6 August 1915. Walter MEURANT, Died of Wounds, 3 August 1917. Francis Cornwall MOAD, Died of Wounds, 8 November 1916. John MOCATTA, Died of Disease, 3 March 1917. Hayward Hugh MOFFATT, Died of Wounds, 21 September 1918. George MORRIS, Died of Wounds, 30 July 1915, and subsequently buried at sea. William Benedict MULRONEY, Died of Disease, 6 August 1918. Thomas MURPHY, Killed in Action, 3 October 1915. Frank MURRAY, Died of Disease, 7 November 1918. Vernon William MURRAY, Killed in Action, 22 May 1915. Lance Douglas NICOLL, Killed in Action, 24 October 1917. Assal John O'BRIEN, Died of Wounds, 29 March 1918. Dougald O'BRIEN, Died of Disease, 7 November 1918. William Harold O'BRIEN, Killed in Action, 12 July 1915. Samuel O'DELL, Died of Wounds, 19 August 1915. William Francis O'DONNELL, Killed in Action, 27 October 1917. George Sinclair OLSEN, Killed in Action, 31 July 1916. Lyle Hugh Florence O'NEILL, Killed in Action, 17 September 1915. Stanley Ernest PARKES, Killed in Action, 24 May 1915. Erroll McLeod Nunn PATTRICK, Died of Wounds, 1 June 1915, and subsequently buried at sea. Harry PAULIN, Killed in Action, 19 July 1916. Norman Matthew PEARCE, Killed in Action, 29 July 1916. Arthur Oswald PETERSEN, Died of Disease, 28 October 1918. William PLATER, Killed in Action, 4 August 1915. William Wickford POTTER, Died of Wounds, 3 December 1917. James POTTS, Died of Wounds, 22 November 1917. Albert James PRENDERGAST, Killed in Action, 3 November 1917. Thomas PRESLAND, Killed in Action, 25 September 1918. Leslie Alfred PRYOR, Killed in Action, 28 March 1918. William Thomas RAYNER, Died of Wounds, 11 November 1915, and subsequently buried at sea. Claude Thomas REDMAN, Died of Disease, 18 May 1918. Rupert Noel RICHARDSON, Killed in Action, 17 September 1915. Francis Leigh RIDGWAY, Killed in Action, 28 March 1918. Kenneth Cory RILEY, Killed in Action, 27 March 1918. John RITCHIE, Killed in Action, 4 August 1916. William David ROBERTSON, Died of Disease, 29 July 1915. Ernest Henry Walter ROBINSON, Died of Disease, 16 February 1919. Henry ROBSON, Killed in Action, 24 July 1915. Walter Edgar John ROBSON, Died of Wounds, 24 July 1916. Kenneth McGeorge RONALD, Killed in Action, 12 July 1915. John Edwin ROSS, Killed in Action, 21 August 1917. John Wright RUSTEN, Died of Wounds, 10 July 1918. James Daniel RYAN, Died of Accident, 10 June 1916. Patrick Francis RYAN, Killed in Action, 18 September 1918. Ernest Roderick SADLER, Died of Disease, 18 October 1918. Alexander Britton SAMUELS, Killed in Action, 11 April 1917. Gerald Douglas SCHOLEFIELD, Died of Disease, 23 December 1917. Allen Wylie SCOTT, Killed in Action, 6 September 1917. Richard Elwyn SHANNON, Killed in Action, 20 November 1916. Wallace John SHARPE, Killed in Action, 28 March 1918. Edgar Robert SHERMAN, Died of Wounds, 30 September 1917. Norman Douglas SHERWIN, Died of Wounds, 29 March 1918. Charles William SMITH, Died of Disease, 1 October 1918. George Achilles SMITH, Killed in Action, 9 January 1917. Sydney Gordon SMITH, Died of Wounds, 19 October 1918. Eddy Blackwood STEVENS, Killed in Action, 28 September 1915. Frank Alfred STEWART, Killed in Action, 7 August 1915. Houston Thomas STEWART, Died of Wounds, 15 November 1917. Everett Graham SUMMONS, Died of Wounds, 30 September 1918. Harold Victor TEBBUTT, Died of Wounds, 20 September 1918. Alfred Charles THOMPSON, Killed in Action, 2 November 1917. Walter TIPPING, Died of Wounds, 21 August 1916. Ferdinand Pearson TOMPSON, Died of Disease, 3 April 1919. John Leslie TOOTH, Killed in Action, 8 June 1917. Owen William TOOTH, Killed in Action, 3 December 1917. Frederick Robertson TRESILIAN, Killed in Action, 21 July 1915. Leo Augustus Francis USSHER, Killed in Action, 17 April 1917. Thomas Herbert VANCE, Died of Wounds, 27 March 1918. Arthur VERGE, Died of Disease, 8 September 1915. Stephen Lawrence WAKELING, Died of Disease, 10 April 1917. Geoffrey Hughes WARREN, Killed in Action, 3 November 1917. Harold William WATTS, Died of Wounds, 17 September 1915, and subsequently buried at sea. Arthur Edward WAYGOOD, Killed in Action, 28 March 1918. Edwin James WHITE, Died of Wounds, 25 June 1917. Frederick Arthur Victor WHITE, Killed in Action, 27 March 1918. Alan Mcgregor WHYTE, Killed in Action, 8 October 1917. Charles Henry WILKINS, Killed in Action, 28 March 1918. Henry Charles WILLIAMS, Died of Wounds, 1 April 1918 . Frank James WILLIS, Killed in Action, 4 September 1917. Harry Noel WILSON, Killed in Action, 4 August 1916. Raymond WILSON, Died of Wounds, 18 August 1915. Charles Robert WINDEYER, Killed in Action, 12 October 1917. Richard Henry WINSLETT, Killed in Action, 19 April 1917. Edgar Alma Mark WRIGHT, Killed in Action, 4 August 1916. Geoffrey Heron YEOMANS, Killed in Action, 22 July 1916. John Henry YOUNG, Killed in Action, 17 September 1915. The 6th Light Horse Regiment Loyd Lindsay Team displaying their wallaby fur puggarees, 1916. One Light Horse Regiment that clearly never wore the emu plume was the 6th Australian Light Horse Regiment, AIF, which chose to wear the wallaby fur puggaree to distinguish this regiment from others. 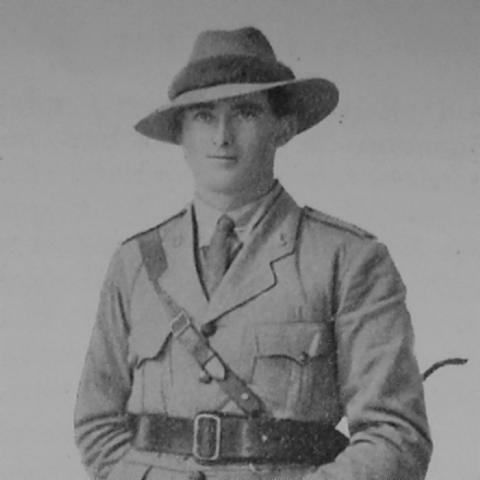 The photograph of Major Donald Gordon Cross demonstrates clearly the correct use of the wallaby fur puggaree upon the felt hat. The 6th Australian Light Horse Regiment, AIF, never wore the emu plume but remained attached to the wallaby fur puggaree from conception till the unit was disbanded in 1919. A good book to read on the 6th Australian Light Horse Regiment, AIF was written by Lieutenant George Lachlan Berrie called, Under Furred Hats (6th ALH Regt), and published in Sydney, 1919. Copies are rather limited and fetch a high price in the second hand market but there are those still available at the metropolitan public libraries. Lieutenant George Lachlan Berrie produced a unit history published in 1919 called Under Furred Hats (6th ALH Regt) which included a section specifically related to the battle of Beersheba and is extracted below. Every possy they passed was littered with green date peelings, and the prisoners they took looked like hunted devils. What on earth was the waiting for? They had been there an hour now, literally frying on the sand. He knew they were going to attack Katia. Plenty of water there, and probably a strong Turkish rear guard. But this infernal waiting was taking the last remnants of vitality out of everyone. He thought of something long, drawn through ice, if he ever went on leave again. He could hear a couple of chaps rowing over their horses disturbing each others' shade. They were agreeing to settle the argument after they had settled the Jackos. They were mates, too. Well, it was enough to make any man quarrel with his best friend, this infernal waiting on top of everything else. But no sign of a move. Some Jacko guns were thundering from behind Katia, and he could see shrapnel bursting away towards the left flank. There seemed to be no one over towards Hamisah. Perhaps they were waiting for another Brigade to come up. Thank God the front of the column was mounting. Swinging out into artillery formation they moved quietly towards Katia. Crossing the first skyline was enough to draw shrapnel, but a steady gallop, screened by the hollows between dunes and a scanty hod or two, brought them safely to the series of little sandhills fronting the dry swamp behind which lay Katia. A few minutes later the Bushman found himself part of an extended line doubling from one sand hill to another and wondering why more men didn't go down. Jacko had evidently plenty of machine guns planted in Katia, and from the burst of his shrapnel away to the rear it looked as though he had located the horses. They were now on the edge of the dry swamp. It was a good half-mile to the first palm trees and the only cover worth talking about was a small outcrop of sand running parallel to the hod. Two or three hundred yards away it was. The men who got there would be lucky. Ah, they were off again. The ground was hard; better to run on. They were going down now; the man on his right pitched forward on to his face; and, glancing along the extended line as he ran, he could see figures lying still and others trying to crawl or limp back to the shelter of the sandhills they had just left. That was close. Flecks of dirt spattered up all round him. Another minute and he lay panting behind the friendly shelter of the last cover they `would get before the final assault. He turned his head to watch the second line coming up. Continuous bursts of machine gun fire were following them all the way. They had got the range properly now. A sergeant was making towards him; another twenty yards and he would be safe. Ah, they had got him, and it looked like for keeps. The Bushman joined in the rush of several others and dragged the sergeant in behind the nearest sandhill. "How in hell are we going to carry him out?" "On our rifles and crossed arms. Two on each side, one take his head and the other his legs. Now, lift him steadily and keep in step as much as possible. Make straight for the sandhill." They had padded the rifles as best they could. But no matter how carefully they stepped they knew that every movement cost the silent figure untold agony. Yet not quite silent. The wounded man spoke as they started: "You fellows are Britons to stick to a man like this." Walking almost on each other's spurs and cramped by their necessarily crouching attitude, the huddled group of men moved at a snail's pace for the nearest shelter. They crossed the dry swamp almost unmolested. The sun was setting and its flickering rays dancing on the background of red sandhills blurred them as a target. But as they struggled up the first ridge the sand spat about their feet and the quiet figure spoke again. "Put me down behind the hill and send a sand cart after dark. Six of you make a big target, you know," and in a whisper as they struggled on, "It's good to have mates like you chaps." In the British Military Cemetery of Old Cairo stands a monument erected by his comrades to one of the bravest of the brave Sergeant Major Johnston. For two days we rested, buried our dead and collected from the battlefield any gear abandoned by the enemy. On the afternoon of the 8th we moved out once more in pursuit of the enemy, now retreating everywhere, but concentrated in force at Bir el Abd. Leaving Katia at 10 p.m. we moved forward to take part in a strong reconnaissance of Bir el Abd. An attempt was made to encircle the position. The 3rd L.H. Brigade operated from the south, the New Zealand Brigade from the west, the 2nd Brigade from the north, and the 1st Brigade, it possible, was to menace the position from the east. Less than an hour after sunrise the following morning the action started. Accompanied by the Ayrshire Battery, the 2nd Brigade approached its position by daylight and was warmly welcomed by a series of 4.7 H.E.-'s bursting in close proximity to the column. As reserve to the Brigade, the Regiment, now under Major Bruxner, was stationed several hundred yards south of the Ayr shire Battery's position. All day long the Battery waged a vigorous duel with the enemy's 4.7 and shrapnel, and one unlucky direct hit put several teams of horses, a gun, and its crew out of action. Vainly the enemy tried to locate our led horses, but although several high explosives came very close, we suffered no material damage. A general attack took place at 11 a.m. and the New Zealand Brigade was drawn into an awkward position during a heavy encounter. To assist in their withdrawal during the afternoon, the Regiment went into action, and finally covered the withdrawal of the badly knocked about Ayrshire Battery. We withdrew to Oghratina where we drew rations and forage and bivouacked for the night. Returning to Khirba next day we found the deserted Turkish camp to contain some very acceptable articles of loot. Barley for the horses was plentiful, and besides tea, dates, meal and olives, there were several hundredweights of dried apricots pressed into rolls like brown paper. Under the comprehensive name of "mungaree" we learnt during the next few days to envy the Turks its possession as a ration issue. For two days we remained at Khirba, and here we said farewell to "Galloping Jack." In a brief address he bade us good-bye from the saddle, and his exit in a cloud of dust over a sandhill and followed by deafening cheers, was truly characteristic of our brief but unforgettable experience of his leader ship. From Bir el Abd to Katia we saw evidence of the great difficulty the enemy had had in transporting his heavy artillery through the heavy sand. Besides temporary roads of brambles, they had used some thousands of feet of 9 by 2 inch planking, placing it in front of the guns and moving them along with what must have been snail-like, if sure, progress. But what can be said of the great feat of the Turkish Infantry. We, on horse back, knew what it was to campaign during the desert midsummer. Their secret march to Oghratina unobserved by aerial patrols was in itself remarkable enough, but their sufferings during the weeks culminating in the battles of Romani and Katia must have been intense. On foot, carrying full infantry gear, living partly on green dates, and during the last two days waterless, their effort to drive us from Romani was, in spite of failure, such as to rouse the utmost admiration amongst their conquerors. The enemy were now in full retreat eastwards of Salmana, and for the time being our acquaintance with him was ended. Withdrawing via Katia we returned to Et Maler on the 13th of August, and for the rest of the month, both horses and men enjoyed a, badly-needed rest. The casualty list of sickness and death made a number of vacancies amongst the officers, and the following were promoted to commissioned rank:-Sig. Sgt. J. Back, Sgts. Allman, Ronald, Lomax and Corp. H. Dickson. Popular also were the captaincys of Lieuts. Thompson, Tooth S., and Close. The worst of the summer heat had now passed, and horses were beginning to be inured to the hard ships of desert life. But a number had succumbed to the strain; sand colic and sore backs were the predominant ailments, and many had to be evacuated to Veterinary Hospitals and replaced by re mounts. We left Et Maler on the 11 th of September and, moving by Katia, reached our new camping area, Hod el Hassaniya, the same after noon.